In curative physical culture for the prevention and treatment of diseases and injuries are the following fixed assets: physical exercise, gymnastics, sports and applied, ideomotor, i.e. executing mentally, exercises in sending impulses to the muscles and others), natural-nature factors (sun, air, water), medical massage, movement. 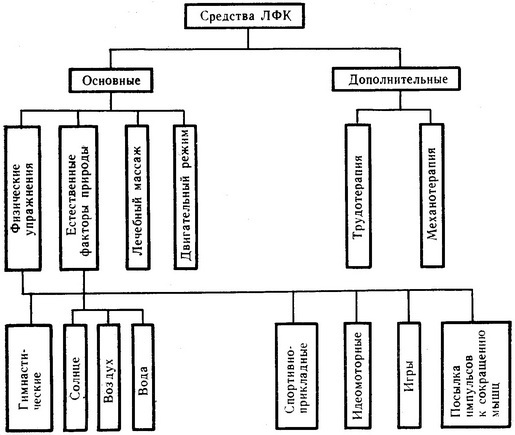 In addition, the use of additional tools: occupational therapy and mechanotherapy (see diagram). Under the occupational therapy refers to the restoration of impaired functions using selectively chosen labour processes. Mechanotherapy is the restoration of the lost functions with the help of special devices. It is mostly used to prevent contractures (stiffness in the joints). In sports practice after injuries of the locomotor apparatus can be used to increase the amplitude of movements in joints fitness device (attenuated method). Therapeutic massage (classic, point, reflexosegmental) used as the treatment and prevention of diseases (for example, hygienic massage, performed in the complex morning hygienic gymnastics). Means of therapeutic physical culture, used in sports practice and for the prevention of diseases, refer to the means of therapeutic physical training.